For even better experience, Nuledo introduced the unique features which turn the Nuledo Cloud chamber into the best tool for education, demonstration and popularisation of particle and nuclear physics in the world. 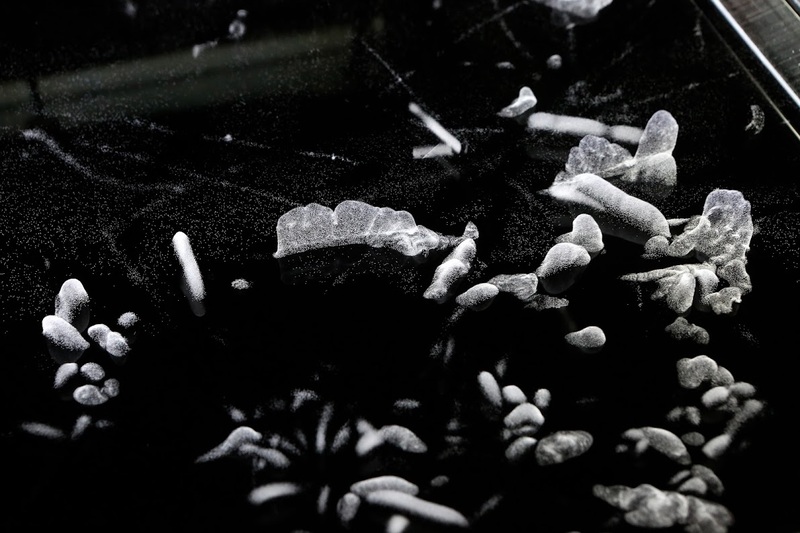 In Nuledo Cloud Chambers it is possible to observe not only the natural radiation but even to interactively display the particles from artificial radiation sources. Just a single press of a button allows the observer to see the radon decay chain and particles emerging from americium and strontium radioactive element samples. Nuledo Cloud Chambers are manufactured with the highest precision and care for maximum satisfaction of our customers. However, our duty does not end in the manufacturing hall. 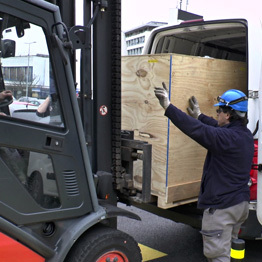 The price of shipping and installation depends on the final location and is not included in the price of the device. Contact us for a price offer. The legacy of Nobel prize laureate, Charles Wilson, was newly refined with the latest engineering technologies and fine handcrafting into fully interactive, more advanced, and more personalised apparatus than ever before. Nuledo Cloud Chambers are unique devices, that can visualise usually invisible particles of ionising radiation, which naturally surround us. 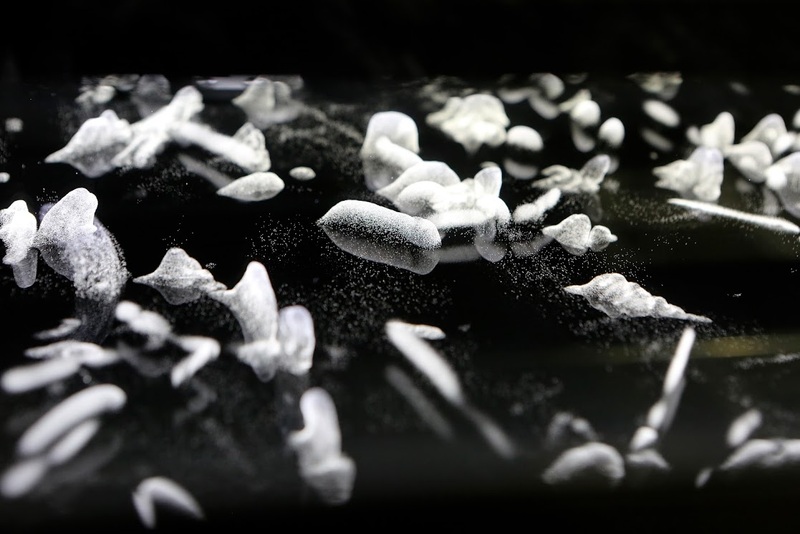 In Nuledo Cloud Chambers you can observe particles smaller than individual atoms by a naked eye and explore the microscopic world defying the common sense. Only with Nuledo cloud chambers can secondary school and university students as well as the general public easily learn how the universe works on the microscopic scale. Alpha particles are groups of two protons and two neutrons i. e. helium nuclei. Alpha particles create shorter and thicker tracks in a cloud chamber. Rays of alpha particles are called alpha radiation. It is the least penetrating kind of radiation; it can be stopped by a sheet of paper or even a few metres of air. Natural sources of alpha radiation are, for example, uranium, radium or radon. Radon-222 isotope is known for its potential to cumulate in buildings, since it is often naturally released from Earth’s crust. An example of an artificial source of alpha radiation is the americium-241 nuclide of the element americium, which does not exist naturally. Various thin, twisted or straight cloud tracks are formed by electrons. Length and shape of an electron track, depends on the energy of the incoming electron. High energy electrons form straight lines, electrons with lower energy easily change their direction when colliding with molecules of isopropyl alcohol. Electrons displayed in a cloud chamber have their origin in both radioactive transformations that happened on earth, and in secondary cosmic radiation. A ray of electrons is called beta minus radiation. Beta radiation is more intense than alpha radiation; it can be effectively blocked by about 1 mm thick slab of lead. Positron is the first discovered particle of antimatter; it is the antiparticle of an electron. Its track is identical to the electron one. Tracks of these particles can be distinguished only when the cloud chamber is placed into a magnetic field. This causes the tracks of electrons and positrons to bend in the opposite directions due to opposite charge. After all, this is how the positron was observed by Carl Anderson in 1932, who received a Nobel Prize in physics for this discovery. Observed positrons originate from the cosmic radiation or from the natural radioactive decay on Earth. Rays of emitted positrons are called beta plus radiation. An example of a natural source of beta plus radiation is potassium-40, which happens to be contained in significant amounts in bananas. Consumption of one banana represents a dose equivalent to about 1 % of an average daily dose of natural radiation. We can encounter positrons in medicine as well, specifically in Positron Emission Tomography (PET). It is a diagnostic method, which can visualise only desired tissue. This method is based on introduction of radiopharmaceuticals, into the body of a patient. These radiopharmaceuticals are sources of beta plus radiation, i. e., emitters of positrons. Escaping positrons annihilate with electrons in atoms of human body while creating photons. Consequently, the detector registers these photons and calculates the position of annihilation. It is also possible to identificate annihilation of positron and electron in a cloud chamber from the characteristic appearance of their tracks. Thick tracks that often extend over the whole area of a cloud chamber belong to protons, particles that make atomic nuclei. These protons originate in cosmic radiation. Proton tracks can vary in length from the whole width of the chamber all the way to a dot – depending on the angle at which the proton enters the cloud chamber. Protons are also used in medicine, specifically in radiotherapy. In proton therapy accelerated protons are used to irradiate ill tissue; specifically tumours and carcinomas. Proton therapy is an example of a real life application of, originally, a research device. Protons are accelerated using a particle accelerator called cyclotron. Muons are created by interaction of cosmic rays with the atmosphere and penetrate all the way to the Earth’s surface, where we can observe them e. g. in a cloud chamber. We can observe muons in spite of their short lifetime due to time dilation, one of the effects described by the special theory of relativity. Muons move towards ground at a speed close to the speed of light and thus can arrive before they decay. Thus, if you see a cloud track in a cloud chamber similar to electron, but completely straight due to large speed, it may very well be a muon! Cosmic radiation are rays of particles coming at high speed from space and hitting the Earth’s atmosphere. There, a creation of secondary cosmic radiation occurs during interaction with molecules of air. We can clearly distinguish cosmic radiation in a cloud chamber, because air showers take form of several cloud tracks oriented in the same direction and arriving at the same time. Particles of cosmic radiation originate mainly in the Sun but also in the interstellar or even intergalactic space. During a fly-by of a relatively heavy particle with high energy, it is possible to observe tracks of delta ray radiation. These tracks are electrons which are ripped from molecules of isopropyl alcohol by heavy particles like protons. In the cloud chamber, we can then see a straight track of a proton surrounded by thin tracks of electrons. These escaping electrons are called the delta ray electrons. Gamma radiation is not directly visible in a cloud chamber because it is an electromagnetic wave radiation and not a ray of charged particles. However, it is possible to compensate for this partially. 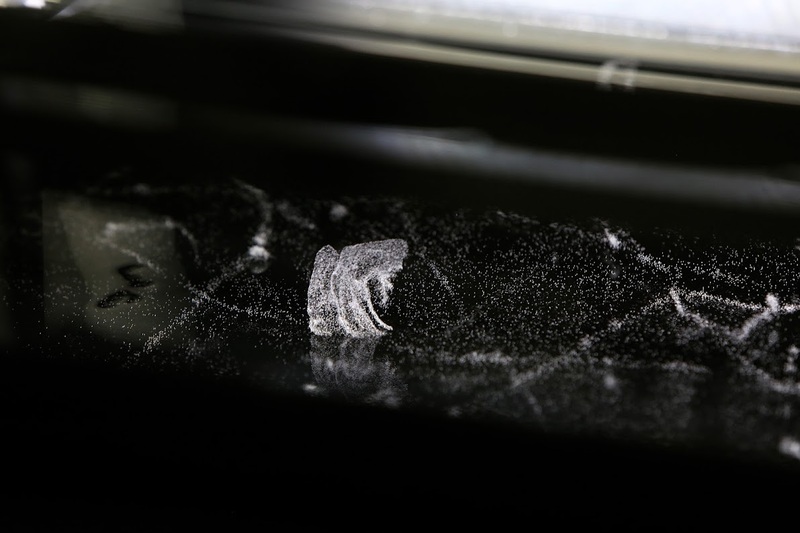 By bringing a source of gamma radiation close to the glass of a cloud chamber, electrons are ripped from glass molecules and shot inside the chamber. Consequently, we can observe these electrons in the cloud chamber. V-shaped tracks are created by two alpha particles, which were emitted within a very small region of space. When radon-220 is present in the cloud chamber, we can see its decay to polonium-216 followed by an almost immediate decay to lead-212. These two decays can be detected as V-shaped tracks of two alpha particles originating from the same point. Radon-220 can be injected into the observation area using the interactive Radon module button. Nuclear half-life is a time interval needed for a half of the particles to decay. In a cloud chamber we can demonstrate this phenomenon using radon-220 and its characteristic V-shaped tracks. After injecting radon-220 into the observation area of the chamber, we observe the maximum frequency of V-shaped tracks. Radon-220 has half-life of one minute. Therefore, after this interval, we observe a half of the initial V-shaped track frequency. If we wait another minute, another half-life interval, we measure a quarter (a half of a half) of the initial frequency. Radon-220 can be injected into the observation area using the interactive Radon module button. Thorium series is one of the four basic decay chains in nature. These chains are known series of decays of common radioactive elements, their transformations to new elements and the radiation they emit. 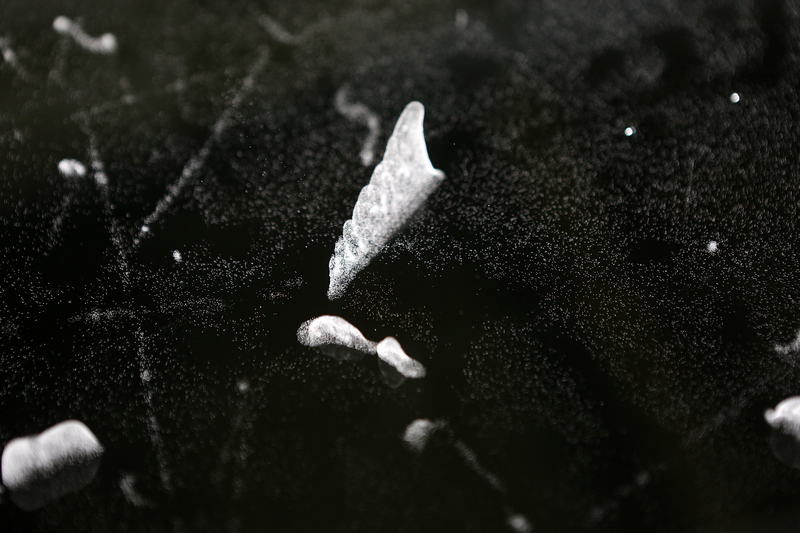 In a cloud chamber we can observe a part of the thorium series after injection of radon-220. Radon-220 decays to polonium-216 that almost immediately decays to lead-212. Since both of these transformations produce alpha particles, thick, V-shaped tracks are observed. Radon-220 can be injected into the observation area using the interactive Radon module button. Apart from the background radiation, ionising radiation can also be observed by placing an artificial radiation source into the observation area of the cloud chamber. An example of an artificial source of alpha particles (alpha radiation) is americium-241. Upon insertion of a sample, we can observe outgoing tracks of alpha particles. An artificial source of alpha radiation (americium-241) can be robotically inserted into the observation area using the interactive Radionuclide module. Apart from the background radiation, ionising radiation can also be observed by placing an artificial radiation source in the observation area of the cloud chamber. An example of a source of electrons (beta radiation) is strontium-90. Upon insertion of a sample, we can observe numerous long thin tracks of electrons resembling a radial fan. An artificial source of electrons (e. g. strontium-90) can be robotically inserted into the observation area using the interactive Radionuclide module. Pions are particles consisting of a pair of elementary particles – quarks “u” and “d”. They always contain one quark and one anti-quark. In a cloud chamber we can observe tracks only of the charged pions. Tracks of pions are very similar to electron tracks and thus are very difficult to distinguish from each other. It is possible only by inspection of the propagation of their tracks. Pions originate in the secondary cosmic radiation that is created in the upper part of atmosphere by interaction of the primary cosmic radiation with molecules of air. Kaons are particles consisting of a pair of elementary particles – one quark “s” and one of the quarks “u” and “d”. They always contain one quark and one anti-quark. In a cloud chamber, we can distinguish kaons from other particles only by observing their decay into pions. Kaons were discovered in cloud chamber photographs in 1947 during cosmic-ray air shower research. They originate in the secondary cosmic radiation that is created in the upper part of atmosphere by interaction of the primary cosmic radiation with molecules of air. Elastic proton scattering is one of the rarer phenomena which can be observed in a cloud chamber. It is an interaction of two protons elastically colliding with each other. In a cloud chamber it is possible to observe a decay by weak interaction of muons into electrons. This decay is clearly visible in the track propagation. A thicker muon track suddenly sharply breaks and becomes thinner – a muon has decayed and a thinner track of an electron is observed. The rest of resulting particles – muon neutrino and electron antineutrino – is not charged and thus cannot be observed in a cloud chamber. Annihilation occurs when a particle meets its antiparticle. The best-known example is annihilation of an electron and a positron, which creates two gamma photons. In a cloud chamber we observe this phenomenon as two thin tracks which end at the same point. Gamma photons are not observable in a cloud chamber since they do not carry any electrical charge. It is also possible to encounter this phenomenon in the opposite order i. e. a gamma photon decomposes creating an electron-positron pair. The first ultra-high energy particle, which had energy comparable with a kinetic energy of a flying football balloon, was observed in 1991. This particle must have come from space, but its exact origin has not been explained yet. The Oh-My-God particle resembles a high-speed proton in its properties. Theoretically it is possible to observe such particle in a cloud chamber, but only a few such particles have been recorded to date. Where does the radioactivity come from? Is it artificial or natural? Radioactivity is a process in which an atom of one element transforms into one or more atoms of other elements. A byproduct of this decay is ionising radiation that carries the excess energy released. Some radioactive elements occur commonly in nature, e.g. uranium or radon. It is these elements that create the natural radiation to which we are exposed every day of our lives. However, if humans artificially create a radioactive material, we call this radiation artificial. What is alpha/beta/gamma radiation and how much do they penetrate matter? Ionising radiation is a flow of particles from a material undergoing a radioactive decay. Not all materials, however, emit the same particles. There are three basic kinds of such radiation: Alpha, where particles are the helium nuclei and which cannot penetrate even a sheet of paper. Beta, where particles are electrons or positrons and which can be stopped by a thin layer of a metal. Gamma, where the particles are photons and which can be stopped only by a thick layer of lead or a similar material. How to understand a radioactive transformation? Atomic nuclei are made of two kinds of particles: protons and neutrons, where the number of protons determines what element it is. The ratio of the protons and neutrons then decides whether radioactive decay will occur. Simply put, if an element is not happy with its number of neutrons, it is radioactive. How to imagine an atom? In everyday life as well as in science until the beginning of 20th century, the world seemed to be well described by Newtonian mechanics. This means that objects change their positions and speeds according to forces that act upon them. However, many very accurate experiments lead physicists to develop a different model of the world called quantum mechanics that explained the experiment in a more accurate way. In quantum world objects can’t be assigned by macroscopic attributes like speed or trajectory, on the other hand we can talk about probability densities. As an example, if we take a positively charged atom nucleus and surround it with negatively charged electrons, we will not end up with an analogy of tiny solar system. Electrons do not fly around on different orbits like planets around the Sun. A better way of imagining it, is like a cloud of electrons surrounding the nucleus. The density of the cloud gives us the probability of finding an electron in that position. What does a decay chain look like in real life? Nuclei of radioactive atoms, both natural and artificial, undergo a decay into nuclei of different nuclides (atoms with different numbers of particles in their nuclei). However, many of these decays produce nuclides that are also radioactive. In that case the decay continues until a stable nucleus is created. This process is called a decay chain. In a cloud chamber, we can observe the decay of e. g. Radon-220 to polonium-216, which is so unstable that it almost immediately decays to lead-212. Thus we observe two alpha particles, one from each decay, originating from almost the same location. The radon decay chain then continues through three more decays to its final stable product, lead-208. What does the protection against radiation mean and how to avoid another “Chernobyl disaster“? Ionising radiation is omnipresent, but if organisms are exposed to it in higher doses, it has undesirable health consequences. We could say that radiation is a good servant but a bad master. If we want to use ionising radiation to our advantage, we must at the same time ensure safety of all people as well as the environment. The Chernobyl disaster was not just a combination of coincidences but mainly a severe violation of safety regulations of nuclear power plants. If we adhere to all safety rules, nuclear power plants are a safe source of electric energy as shown by functioning power plants all around the world. What are the principles of nuclear medicine like PET (positron emission tomography) and a proton therapy? PET = positron emission tomography is a diagnostic method based on a radioactive material with a short half-life. This material is introduced into the body and accumulates in metabolically active tissues like cancer tumors. If we detect the radiation particles emitted, we can determine the position of the tumor. Proton therapy, on the other hand is a therapeutic method, in which the tumour is irradiated with a flow of protons. Protons are used for their smaller side effects compared to other forms of radiation. What are the elementary particles and what kinds of them do we know (quarks, electrons, mions, tauons, neutrinos, photons, Higgs’ boson, bosons W+, W- and Z0)? Elementary particles are particles that have no internal structure, i. e. we cannot split them to any subparticles. In past, scientists once thought that the elementary particles are just proton, neutron, photon and electron. Today we know that only electron and photon are elementary particles and that protons and neutrons are composed of quarks and gluons. Also some new elementary particles were discovered: muon, tauon, bosons W+, W- a Z0, the Higgs’ boson and neutrinos. All other particles then necessarily must be composed of the elementary ones. What are the composite particles (proton, alpha particles, pion, kaon)? Composite particles are composed of the elementary particles. E. g. The alpha particle is made of two protons and two neutrons, each of which is made of three quarks and gluons. What do bananas, potassium and antimatter have in common? Bananas are very rich source of dietary potassium and it is potassium that happens to be one of the elements with a relatively high natural radioactivity. Potassium-40 isotope is unusual because it can undergo three types of decay: gamma, beta+ and beta-. Beta+ radiation is made of antimatter, specifically of positrons, the antiparticles of electrons. However, do not panic, it is beyond the human limit to eat enough bananas for any effect of radiation to occur. What are the cosmic radiation and “Oh-My-God” particle? Ionising radiation does not originate only on our planet, but also in space. Fortunately, most of it is captured by the atmosphere or the magnetic field of the Earth. The secondary radiation is then emitted during interaction of the cosmic radiation with the molecules of air in the atmosphere. The so called Oh-My-God particle was a particle captured by a cosmic radiation detector in 1991. It got its name because its energy was many times higher than any other particle observed. How can we understand the standard model of particle physics, and why do we use it while knowing it is wrong? The standard model is a model of particles and interactions accepted in contemporary world. It is quite easy to imagine the model. Lets divide the particles of the standard model into two imaginary groups – bricks and grout. By bricks we can understand the first group of particles – they create the matter and the universe. Among particles of the matter belong quarks and leptons. Grout is the other group of particles – force carriers. Force carriers keep objects in the universe together and they are responsible for their interactions. The standard model includes also the Higgs boson – particle the scientist were searching for half a century and finally found in CERN in 2013. The standard model of particle physics used to seem like the final theory of everything that is capable of explaining all of physics. Similarly to other branches of physics, this theory also breaks in certain situations it cannot explain. That means that it is not entirely correct, but it does not mean it is not useful and it shows possible directions of further research. Which particles can move nearly at the speed of light and why the time passes slower for them? The fastest particles we can encounter are those from the cosmic radiation or those artificially accelerated in particle accelerators. As predicted by Albert Einstein’s Special Theory of Relativity, we observe the particle’s time to run more slowly than ours. Particles do not have watches, but if they are unstable, we can observe the time it takes to decay and compare it to a stationary particle. Then we will find out that moving particles decay more slowly than stationary particles, i. e. their time is slower. Where do artificial sources of radiation come from? An element is radioactive if it is not happy with the number of neutrons in its nucleus. Therefore, if we wish to make a radioactive element, we need to foist some protons or neutrons onto it. Such a transformation is called a transmutation and is typically done by irradiating the material with ionising radiation e. g. alpha particles, protons or neutrons. During radioactive decay a lot of energy is released in a form of radiation. Unfortunately, weh do not know, how to directly use the energy of particles so we absorb them in a material. The heat released in this process is used to evaporate water and subsequently we make electricity with a steam turbine. We could basically say that it is just a regular coal power plant with a different method of heating the water. How does ionising radiation affect our health? Ionising radiation, as the name suggests, has the ability to rip electrons from molecules. If this happens a so called “free radical” is created, which is a very reactive chemical species. Free radicals inside cells of our body can react with DNA, the carriers of the genetic information. Cells have many mechanisms of coping with this, but if there are too many such events, cancer or radiation sickness may emerge.